I am back from the Windy city and thought you might like to see a few pictures I took at Anne Marie's Bohemian Ball at Nada Farm. Rebecca and I got all dressed up in our Bo Ho outfits and headed out to the country . It was an amazing evening! The weather could not have been better! We saw so many wonderful friends and blog buddies! And of course....Anne Marie and baby Daniel with photographer extraordinaire Mark Lohman! And so many more but I didn't get anymore people pictures taken! this was one of the many light fixtures Anne Marie made for the event! Too Cool! And another one of Anne Marie's precious children helping someone to their car! All of her Children are just adorable! All of this was set among the rural community where Anne Marie lives~ breathtaking! As for me and Rebecca...we both headed out of her driveway in different directions. She is heading West to the Farm Chicks show! The pack mules were loaded and she says" nada nother" thing would fit in her SUV! 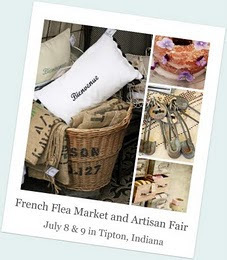 Working on our French Flea Market Event which will be here before we know it! For now...I hope you enjoyed my pictures from Nada! I am happy for you that you were able to attend the event and meet such talented bloggers/designers. Sometimes it seems like all of these gatherings are so far away from Texas! Looks like you had a wonderful time Donna!! Love the country!! I'm sooo jealous! Would love to make it to that show some time! Thanks for giving us who couldn't go a great look at the event! Donna it looks like you had a wonderful time at the farm!!! I loved the pictures of everyone. I am so glad you are home safe and sound. I'm so jealous! What a fun time with such great ladies!!!! And all the awesome treasures--it must have been heaven!!!! Great pictures, and everybody looked great. Looks like you had a great time. Have a good French Flea Market! You were beautiful in your boho outfit that night. It was so nice to have at least a brief time to talk with you and Rebecca. We have all got to get together more often!! so nice to meet you at nada, donna. you are rebecca look like you have so much fun together. i love that!! hope to see you again soon.